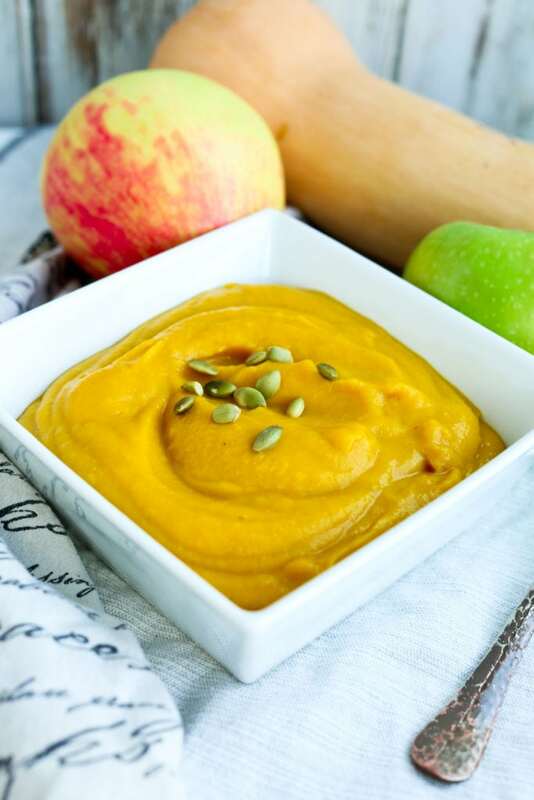 This Butternut Squash Apple Soup is vegan, gluten-free, and a wonderful soup to eat all fall and winter long! Hey guys! I’m bringing an old recipe out of the archives today because even after all these years, I still love this recipe. You deserve to see this recipe. This post was first written in October 2010. I gave the photographs a much-needed refresh and updated the recipe for Butternut Squash Apple Soup just a tad. Just so you know, the new photos are taken the day after I made the soup, so it has thickened considerably. It’s thinner the first day. I’m leaving my original photo below because the post makes more sense with it, plus I think it’s pretty neat to see how food photography on blogs has changed in the last 5-6 years. This type of photo was pretty common back then! Isn’t that crazy to think about?! I’m sure this soup is new to most of you since it’s been buried in the archives with this lovely photo, so I hope more of you try and love it as much as I do! The rest of the post is via 2010, minus the updated pictures and recipe. Clearly, I need to hire a professional photographer and food stylist. Sorry about the sub-par photos, folks, picture taking isn’t my strong suit. Despite the lackluster picture, this lunch was superb. The first time I remember eating Butternut Squash soup was the day I got engaged. After Tim popped the question, he brought me to Sedona (we were living in Arizona at the time) and we had a fabulous dinner at L’Auberge de Sedona. The only thing I remember about the meal, even though I know everything was amazing, is the Butternut Squash soup. Since then, I’ve had a thing for this fall classic. I’ve made several versions, and I think this is my best to date. I served this with an apple panini that is a spin off from Giada De Laurentiis’s Venetian Panino. 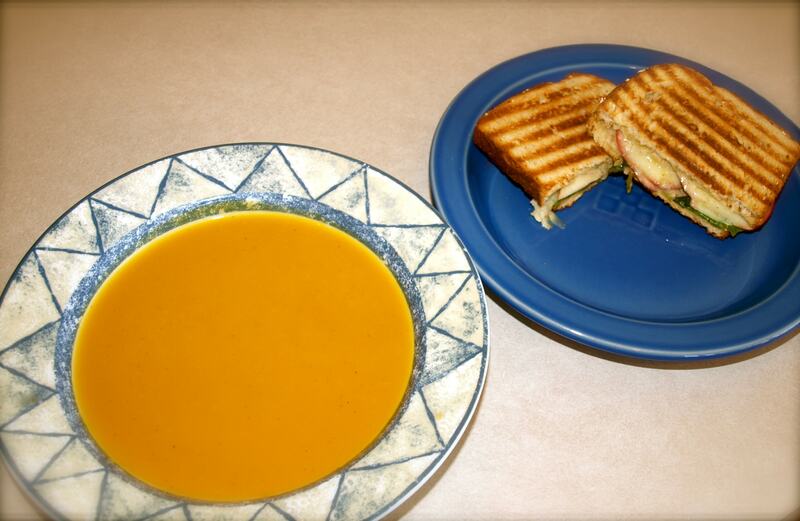 Together, this is a killer combination that makes a delicious, filling lunch. The soup is kid-friendly, too, so if you have little ones they will most likely love this. 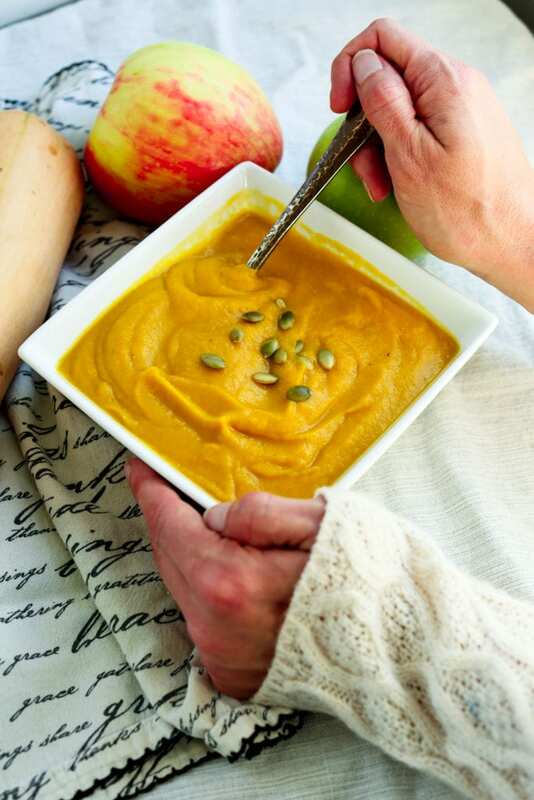 This Apple Butternut Squash soup is vegan, gluten-free,creamy, and delicious! Peel the squash. If you have a decent vegetable peeler, that will work. I find that to be the easiest way to peel a squash. Alternatively, you may need to use a paring knife, which is more tedious. Remove the seeds and cut into 1-2 inch chunks. *Note: you can also roast your squash ahead of time or cook it in the slow cooker. Either method works well. Heat your oil in a large pot over medium heat. Saute the onion until soft, at least 5 minutes. Add squash, apples,stock, cinnamon, turmeric, salt, and nutmeg. Bring to a boil, then reduce the heat. Allow to simmer for 20 minutes. Make sure the squash is nice and soft. 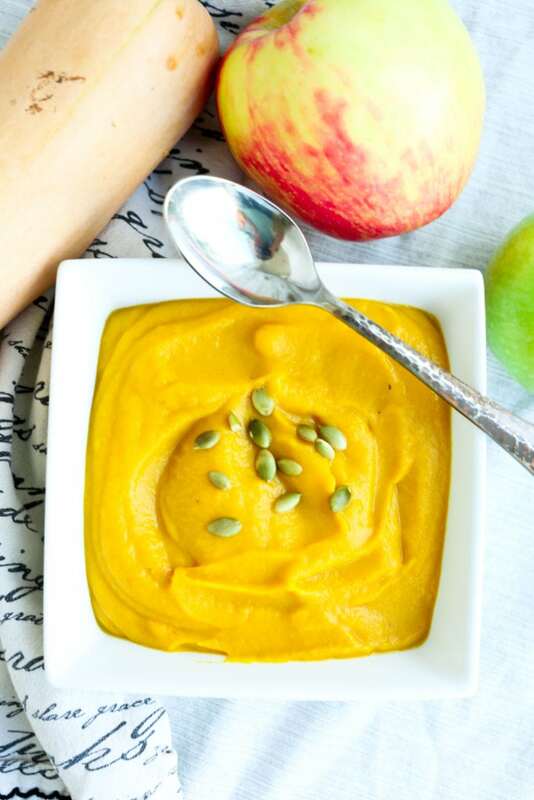 Puree with a hand held (immersion) blender or transfer the soup, in batches, to a regular blender and blend until smooth. Enjoy! ok, wow…this menu SCREAMS fall from the rooftops! what a beautiful pairing! Ok, I’m sold…this is going on my next meal-planning list! I just made this for dinner tonight and YUM! I will say it made way more than 6 servings for me, maybe I added too much squash? I didn’t measure exactly. Anyway- wanted to say thanks for all the awesome posts! I’m glad you liked it! Thanks for letting me know about the servings–I have a really hard time estimating servings and I often post before all the leftovers are gone! Maryea, this soup looks wonderful! I love your photos, they improved so much over the years and now they make me want to eat the screen :).